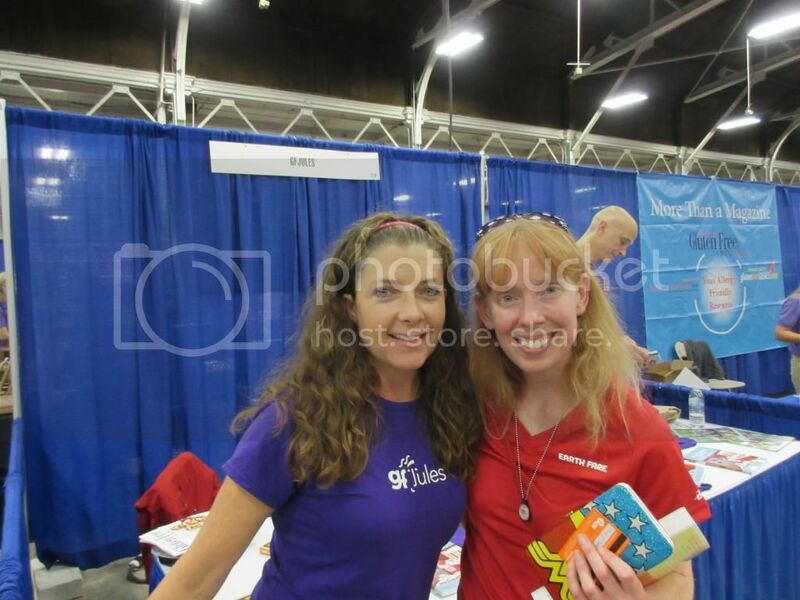 GF Jules and me at the Gluten-Free Food Allergy Fest in Indianapolis, Indiana! This past Saturday, I had the honor of being able to attend the Gluten Free Food Allergy Fest up in Indianapolis, Indiana. I love going to gluten-free expos and events and Indianapolis seems to always have one at some point during any calendar year. This year was no exception, and I was thrilled to read about the new location for this year’s event – the Indian State Fairgrounds. With all the vendors and exhibitors I saw listed, I knew this year’s event was going to be HUGE! I was not let down at all.One of the magazines I currently subscribe to, Gluten Free & More (formerly Living Without), was putting on the Living Without Gluten-Free Food Allergy Fest in various cities this year as a way to show those with food allergies and/or sensitivities that we can live life without deprivation and missing out on delicious food. It was a coming together of the magazine, as well as over a hundred of their favorite exhibitors to celebrate living well. And it was open to anyone who wanted to stop in. Tickets went on sale and, as a subscriber, I received a free entry, and then received a discount code for another ticket…so I had Cathy taken care of as well. So, on Saturday morning, we ate a light breakfast before climbing into the car and hauling up to Indianapolis. We timed it perfectly because we burned through our breakfast just as we got up there, about 30 minutes after it officially opened. And…there was already a line waiting to get in. Oh…that made me happy, indeed. It was a hot summer day already and standing outside in the blazing sun didn’t sound like too much fun…but it wasn’t going to be a long wait. Just about 5 minutes, at the most. And while standing in line, I got to listen to people who have done expos like this before (like me) describe the events and how things work to the first timers. I even got to geek out over favorite products and the like for a few moments. I love making gluten-free friends! Before we knew it, we were inside the doors, in the air conditioning, and getting the tickets scanned. We were given blue wristbands to wear (for re-entry purposes and to show we paid!). Cathy and I put them on and headed into the expo proper. We were greeted at the door by people passing out reusable shopping bags from Glutino (a personal favorite!). Perfect for all the samples and products you are bound to pick up and buy. Trust me, you don’t walk out of these events empty-handed. Cathy and I decided that we were going to be systematic about our approach to each table/vendor/aisle. We’d start on one side and then work our way up, then come back down the other side. This was a good plan in theory, and we decided to start in the middle aisle to avoid the congestion of the end aisles. We soon found out…no matter what…it was just hopping and congested. People were surrounding tables, getting free samples, trying products, trying local baked goods, and the like. So, we ditched our original systematic plan for the…let’s just see what there is and wriggle into open areas when we can. That being said, we began our Gluten-Free Food Allergy Fest at the Glutino/Udi’s/Earth Balance booth, which was giving out samples of Udi’s Gluten-Free Salted Caramel Cashew Cookies as well as Glutino’s Gluten-Free Multigrain English Muffins, schmeared with Earth Balance Creamy Coconut and Peanut Spread. It was all crazy, crazy delicious. I actually have the Glutino English Muffins in my freezer, I just haven’t tried them yet. Now…I know buying them wasn’t a mistake at all. They were delicious. And that Earth Balance Creamy Coconut and Peanut Spread…out-of-this-world good! And from there…it only got better. We made a point to stop by each vendor’s table and talk to them about their products, if we had tried them. If we hadn’t…we would ask all about them. I made a point of raving to the Pamela’s Product people about the Figgies & Jammies. Because they are awesome and worthy of praise. I talked to the Hodgson Mills representative and when I mentioned being a food blogger he said to reach out to the Hodgson Mills team anytime. I was told the same thing by various other vendors as well. And one local vendor who was selling the most amazing bar-b-que sauce and seasoning (which we purchased) said to tag her on Facebook when I use their products so they can read my blog. I was having a great time. I think, though, the best moment had to come at the Freedom Foods table. Because, as many of you are aware, Freedom Foods only makes my favorite gluten-free cereal, Tropic-O’s. NOM NOM! I can’t find this cereal here anymore, since my Whole Foods stopped carrying it, so my parents ship it to me from Birmingham, Alabama. We have a system down. But, recently, they put out a gluten-free, dairy-free, and not-free version of Nutella…which I fell in love with. My local Kroger is the only place that had it…and I bought the last jar of it a few weeks ago. It has never been restocked. So…I stocked up on some Quinoa Pancake Mix, lots of “Smudge” (that’s the Nutella stuff! ), and a few other products to try, all the time raving about how much I love their products and how they honestly care about what ingredients go into all of their stuff. It didn’t hurt that the guy at the table had a New Zealand/Australian accent. HELLO! I actually ended up going back to the table before leaving that day and buying 4 more jars of Smudge. I hadn’t opened the one I had at home for fear I would never find it again. Now…it’s on! I was able to sample some of the best gluten-free Snickerdoodles I have ever eaten. And this pasta that was made from lentils that tasted exactly like regular pasta…but I couldn’t afford the hefty price tag on it. Unfortunately. It was nice to sample it, however. At the very back of the building, for those over 21, was the gluten-free cider/beer tasting area. There was so much food and samples…so I was glad we ate light. And Cathy and I have a system down…where we split a sample so we aren’t filling up on our own. It always works at these events. And soon, after a couple hours of tasting, testing, buying, talking, and exploring, our time at the expo drew to a close. We were going to meet our friend, Greg, for lunch that day, so we bid adieu to the fantastic event and made our way out to the car. This event was probably the best one I have attended so far. Great people, great vendors, great information all around. And I came home with samples and products to try in the very near future. Can’t argue with that, right? Right! I hope they return next year. I’m already making plans to attend. If one of these events happens near you…I definitely encourage you to go! This entry was posted in Asian, Bagels, Baked Goods, Beans, Bread, Breakfast, Brownies, Cereal, Chips, Chocolate, Cookies, Crackers, Dessert, Donuts, Event, Flour, Food, Gluten-Free, Granola, Italian, Mix, Nuts, Oatmeal, Pancakes, Pasta, Pizza, Popcorn, Pretzels, Products, Quinoa, Salsa, Sauce, Snack Bar, Snacks, Soup, Spreads, Sweet Stuff, Tortillas, Travel, Vegan, Vegetables, Vegetarian by The Celiathlete. Bookmark the permalink.